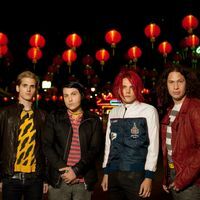 Formed in the wake of the 9/11 attacks, Gerard Way and co were classic High School outsiders with a love of comic books until they came roaring out of the US East Coast underground scene in a blaze of soaring pop metal. Alongside Fall Out Boy and Panic at the Disco, they became poster boys of the growing emo (emotional rock) scene, capturing a mainstream audience with heartfelt lyrics, melodic hooks and theatrical rock anthems. Debut album I Bought You My Bullets, You Bought Me Your Love (2002) dealt in tragedy, despair and thrashing gothic punk guitars, drawing comparisons with Thursday and quickly helping to build a cult following. Three Cheers For Sweet Revenge (2004) further enhanced their reputation before the vampiric rock opera/concept album The Black Parade (2006) sent them global. Like a gothic, stadium-rocking Ziggy Stardust, it reinvented them, drawing on the ambition of classic 70s rock acts like Queen and producing the smash hit Welcome to the Black Parade. 2006 Reprise Records for the U.S. and WEA International Inc. for the world outside the U.S.